The classic “Indian Chess History” by Manuel Aaron and Vijay D Pandit has been officially released. The first copy was presented by FIDE Vice President D.V. 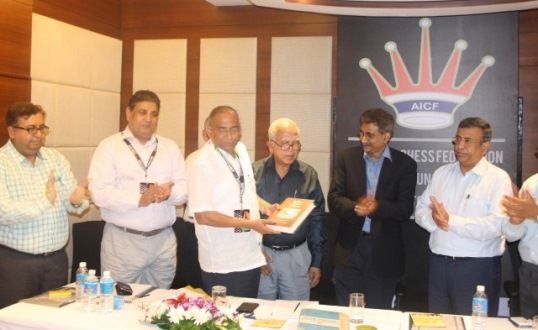 Sundar to the AICF President P.R.Venketrama Raja in the presence of Ashok Jain, President, Maharashtra Chess Association and a large number of State representatives from around the country on October 19, 2014. The release was at the AICF’s Central Council meeting at Hyatt Hotel in Pune during the last round of the World Junior Chess Championship. Speaking during the release, Sundar praised the authors Manuel Aaron and Vijay Pandit for their efforts and sincerity and said that such a huge book could be produced to perfection only by Manuel Aaron and nobody else. This book covers the period from 570 AD when, according to ancient Persian and Sanskrit literature, Shatranj went from India to Persia as a game, to 2010 AD. The author Manuel Aaron is India’s first International Chess Master, nine times National Chess Champion, and two times AICF Secretary. His co-author, Vijay D Pandit, is an internationally known Indian chess historian. For the first time ever we see high quality, annotated tournament games played with old Native Chess Rules where pawns can only move one square at a time, castling is unknown and the king moves like a knight once in a game, etc. * Published in August 2014 this book took six years of research. * Hard Bound, Dust jacket, 600 pages. * Features the period: 570 AD to 2010 AD and a little more. * Sketches and games of all Indian masters from Sultan Khan to Vishy Anand and people who impacted Indian Chess. * Records of all National Champions in all categories. * 165 Cross-tables & charts; 272 Photos; 367 Games; 397 Diagrams. * Many historic photographs. A must read book. * A handbook on Indian Chess down the ages. Any aspiring chess player is sure to benefit immensely by studying this book which contains many top class annotated games. Available from: Chess Mate, 12, 6th Main Road, Kasturba Nagar, Adyar, Chennai 600020. Tel +91-44-24450587. Inclusive of forwarding this book retails Rs.1050 (Rs 900 + carriage) in India and USD 40 (including carriage) for those outside India. For online orders of this book, visit www.chess-mate.com/shop and choose code A23 if you are in India and A24 if you are abroad. ISBN 978-93-5156-258-0. In the picture are R.M. Dongre (Treasurer, AICF), Bharat Singh Chauhan (CEO, AICF), D.V. Sundar (Vice President, FIDE), India’s first International Master Manuel Aaron (author), P.R. Venketrama Raja (President, AICF), Ashok Jain (President, Maharashtra Chess Assn), S.C. Sahu (Vice President, AICF).